Viticulture : Biodynamic (since first planting , 1997). Average production: 130,000 bottles ( 10.833 cases ) . Average alcohol content: 13.5 % vol . Ideal serving temperature : 14-18 ° C ( 57-64 ° F). The grapes are picked by hand and harvested Based On Their phenolic maturation , using small crates . In the cellar, they undergo fermentation in stainless steel vats. After Malolactic fermentation, the wine undergoes Elevage mostly in cement vats until it is blended to be bottled . A small selection of the wine is matured in oak barrels for ten months and then added to the final blend. 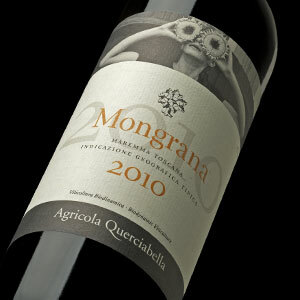 Mongrana is the quintessential expression of the colors , sights and sounds of the Maremma region: fruity and intense , fresh and embracing , the wine ITS takes name – and Its character – from That of the noble family of knights depicted by the Italian Renaissance poet Ludovico Ariosto in His epic masterpiece Orlando Furioso ( “Mad Orlando “).